veryone Is Connected. Connect Your Business To Everyone. The truth is, we no longer live in a world of six degrees of separation. 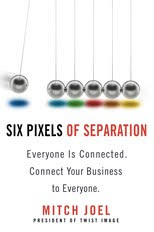 In fact, we're now down to only six pixels of separation, which changes everything we know about doing business. This is the first book to integrate digital marketing, social media, personal branding, and entrepreneurship in a clear, entertaining, and instructive manner that everyone can understand and apply. I am enjoying this book. I read small amounts and then think about it. As someone whose income comes from selling on the internet I am finding this all very interesting. As I read I find I have been doing some things right purely intuitively and some simple things that I should do haven't occurred to me. It is timely reading as I am focusing on merging my blog and website.